From the analysis on NAND and NOR gates, we can extend the equation for logical effort to the case of an arbitrary number of series N and P transistors. 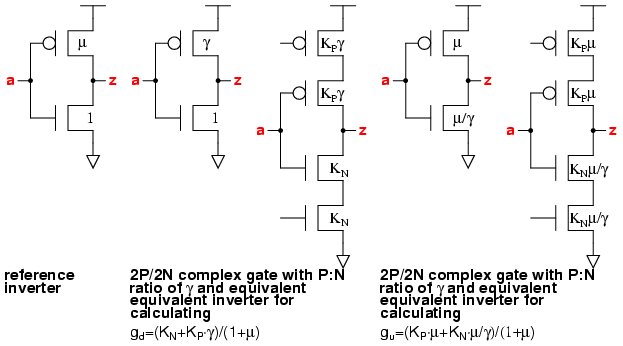 A table of logical effort for all combinations of inverting complex gates from 1-4 series transistors can be drawn up using Ohm's law and µ=2, as in Logical Effort. This can be compared with a table of logical effort used for the vsclib design. The derivation of the numbers in this table is shown below. This is quite a useful result, as it is generic and applies as well to inverters, NAND and NOR gates. from which γ = √(KN·µ/KP) for the fastest gates. We use this expression to draw up a table of the γ values for the fastest gates for all gates with up to 4 series P or N transistors. Our design policy is to have a lower value of γ=2 and an upper value of γ=2.5 in order to keep the output rise and fall drive strengths reasonably balanced. From this table, we can see that all gate types will have γ=2 except for the 3-NAND and 4-NAND, which as we have already seen, will use values of γ=2.33 and γ=2.5. This gives us the table at the top of the page, showing logical effort for all 16 inverting gate types with 1-4 series transistors.